Am I the only person that feels like winter descended on us very abruptly this year? I’m hauling out winter clothes and fluffy bed throws and have been tempted on more than one occasion to put the heater on. I’m not complaining but I was kind of hoping for a few warm autumnal days to spent on the beach before we get into the cold and hopefully damp depths of a Cape Town winter. These recipes, which I have rounded up for Easter feasting, are what I am thinking about these days. Baking at Easter is always a good idea and I have you covered with these stout hot cross buns which are way easier to make than you might think and so much better than anything you will find in a shop. They have been baked so many times by friends of the blog and the feedback has been amazing. The hot cross cinnamon sticky buns or biscotti with hot cross bun flavours are another two delicious options. If you are having an indulgent Easter feast, I think its nice to keep the starter quite casual and rather have people nibble on a few light snacks to liven up the appetite. My best ever chicken liver pate – another classic from the blog, is what I like. Perhaps on some melba toast. A drop of marmalade gives it a sweet edge. Or these tomato & basil crostini with whipped goats cheese. Both can be made in advance. 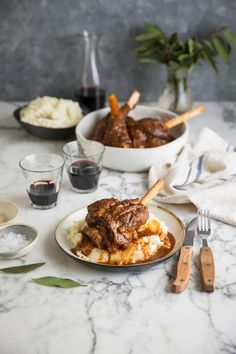 For the main event nothing beats a roast lamb and I love this slow roasted version with rosemary, garlic and harissa. It basically cooks itself leaving you plenty of time to do other things. If you don’t like lamb, this comforting roast chicken with stout, rosemary & honey is a lovely option and both should be served with duck fat roast potatoes. You can check out this comprehensive list of vegetable side dishes if you need any more inspiration. For dessert I love this hot cross bun pudding with chocolate and orange, but the pink swirl meringues with pomegranate syrup are a show stopper. I also love the plum torte because it’s in my top 5 favourite things to bake and plums are in season now. I hope you have the happiest Easter break and get around to making some delicious food. If you ever make any of my recipes, please tag me @drizzleanddip on social media because nothing makes me happier than seeing what you do. And if you feel the need for more chooclate, which I can only assume you do, try these killer chocolate brownies with nutella. Your blog and recipes are fantastic always. It would be so kind and helpful to your readers if you would please post a print button on your recipes for ease of mind and use. Also both ingredient measurements . Maybe weight and grams. HI Cialis, Im not too sure what you are referring to here. The hot cross buns?